GENEVIEVE MAGAZINE ANNOUNCES IT'S 3RD GENEVIEVE PINKBALL ! 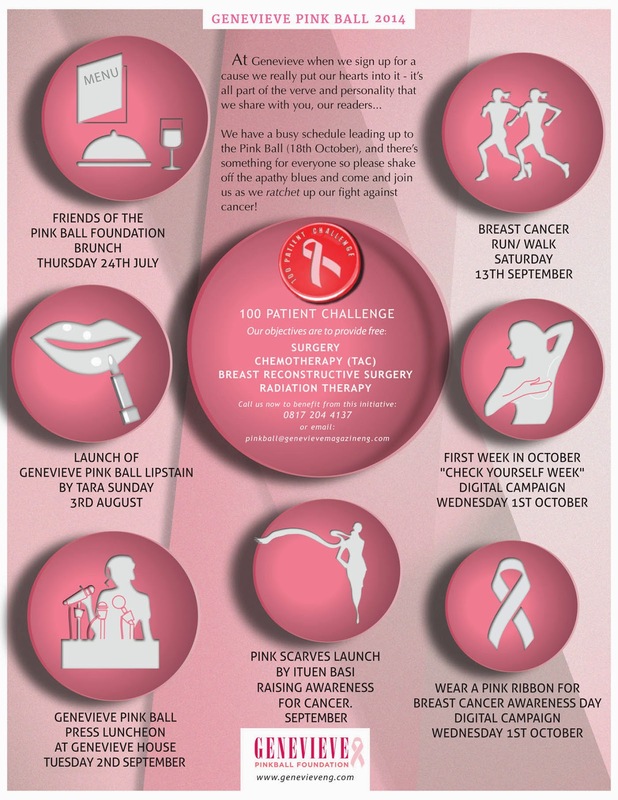 Genevieve Magazine announces its 3rd ‘Genevieve PinkBall’ scheduled to hold on the 18th of October 2014 to help support women both medically and financially towards the prevention and treatment of Breast Cancer. These women would be educated on how to get tested regularly and treatment will be provided to patients who have tested positive. The main mission is to advocate for increased access to care, improve treatment modalities and also increase funding for quality Breast Cancer Research. The 3rd ‘Genevieve PinkBall’ event is set on a very strong and impactful mission to treat over 100 affected patients. 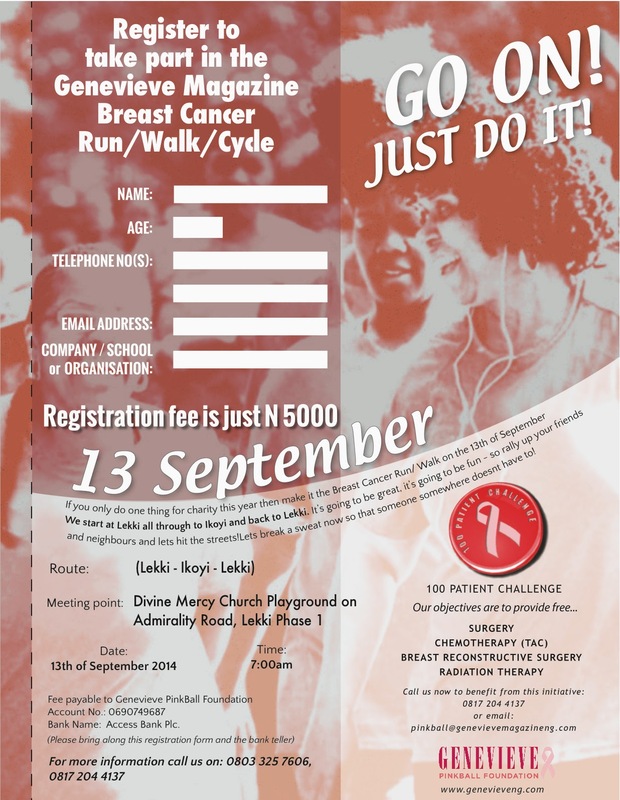 This is an initiative where interested individuals adopt a Breast Cancer patient. The ‘adopted’ patients get funds targeted to cover medical expenses towards the treatment of Breast Cancer. According to the founder and C.E.O of Genevieve Magazine, Betty Irabor: “In Nigeria the majority of women diagnosed with breast cancer do not survive because their cancer is detected too late. Awareness is the First Step in the battle Against Breast Cancer. Herein lies our motivation to lend our platform Genevieve PinkBall to the cause. Our ‘100 patient challenge’ is all about further Awareness Creation, Education and giving hope to the otherwise hopeless; treatment for 100 may seem an insignificant number but it’s a good start. Past history of Genevieve Magazine Pink Ball has shown the event to be a successful one. The first PinkBall took place in 2005 and the second PinkBall was in 2009. The funds realized from the 1st and 2nd PinkBall were used to create programs and awareness for Breast Cancer and also the purchasing of a mammogram machine which is serviced regularly by the Genevieve PinkBall. ‘Genevieve Pink Ball’ for Breast Cancer Awareness is now a Foundation with singer Seyi Shay as the PinkBall Foundation Ambassador. The objective of the Foundation is to create a platform that creates Awareness to reduce the death rates of Breast Cancer by Educating, Screening, Counseling and Providing Treatment for women. The Genevieve Pink Ball has always promoted early detection of Breast Cancer for women over the years with very strong positive feedback we hope to continue the good work with the help of people who believe in helping and saving others. The Genevieve Magazine Pink Ball will take place on the 18th of October 2014, which is the global month of Breast Cancer Awareness, at a brand new water front venue; The Dorchester located at Water Corporation Road off Ligali Ayorinde, Victoria Island. The High Profile Ball will cater to 1000 guests.